. If you do not like to see any red at all in your meat when its cooked, order or make it medium well, that makes it cook through just to the right point. A steak that is made well done should be a crime to meat. , i used a top sirloin steak, steak with a bit of fat around is always a good choice, helps with the grilling process, marinaded it with ground onion and garlic, chilli and salt and seasoning and a tablespoon of olive oil for 30minutes, then i grilled it with a stove-top grill, 5 minutes on each side (you can grill for about 7minutes on both sides for medium well). Resting time for steak after grilling, or baking is also very important, after grilling i left it to rest on a flat plate for 7 minutes, it releases its juices, balances out all the flavor, and lets the heat spread evenly through the meat, note that the meat still cooks through while it rests so if you grill your steak well done before you rest it, you would have a dry piece of meat after resting. Its important to rest it before slicing, very important for all proteins. Resting time should be at least half the cooking time to a maximum of 15minutes. Most of the time when i grill, bake or pan-fry meat i always make a sauce with it, sometimes I'm not interested in making a side and i just make a nice sauce and eat both as a complete meal. 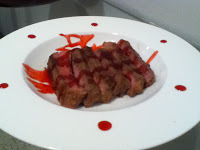 The sauce in this meal was a Raspberry red wine sauce, Its delicious with meat, i add a bit of vinegar and chili in my sauces, so there is a balance of sweet, sour and spicy in there.